When I look at a rose, I see its immediate and apparent beauty, stare just a little bit longer and I see it’s thorns as it’s protective coating, underneath the surface there are things going on which I cannot comprehend to keep that rose alive. Comparing myself to the rose, do I recognise my own individual apparent beauty? While I stare longer, can I see the things I’m using to protect myself from harm? Do I appreciate that beneath my superficial outer layer, there are things going on beyond my control and understanding to keep me alive? I really appreciate nature, there is nothing more satisfying for me than being in a wood, climbing up a hill or camping beside a creek. I am at my happiest surrounded by nature. One of the happiest times of my life was living in a tent in a ‘jungle’, a swampy spot in Byron Bay Australia, we were literally next to a swamp, surrounded by tall trees and woke up to the sound of bush turkeys banging into things. 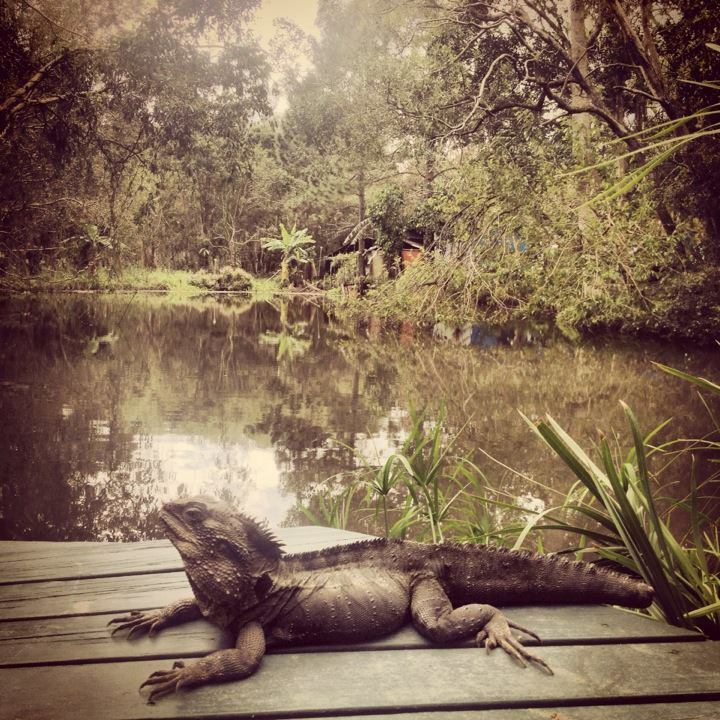 Each day waking up to nature, doing Yoga next to a swamp, while a huge lizard came out everyday to watch us contorting our body. It was surreal but why should it be? Living amongst the world without concrete, without the need for shoes, communally cooking and sharing, seems like the most natural thing to do. The simplicity of being surrounded the way the world naturally is, was definitely not lost on me! How can I take that back into my everyday life? I couldn’t really start walking around barefoot in the city. I mean I could, but I don’t think the feeling of the concrete jungle would be the same experience as wondering around feeling the earth beneath my feet. Instead I try and appreciate the inherent beauty in myself, other people and other animals around me. We are all part of nature too and if you stare for a while at a person, pet or your own anatomy you get that same sense of natural beauty. Really think about the way you perceive other living things, and the way you perceive yourself also as a living thing. It’s easy in the modern world to get caught up in a first outer appearance of something without going deeper. The practice of Yoga is to go deeper, to follow the breath and go inside. To join or yoke yourself with the higher self, admittedly that can be pretty heavy at times even to comprehend or explain. All I’m trying to do is ask of myself and of others that they stare a little bit longer, and think about all the wonderful things their body can do and is doing for them everyday. Once you start appreciating that your body is doing all these wonderful things, you’ll start wanting to move it around, feed it nourishing food and really love it for what it is. The same love can extend to all the people around you, the animals and the earth. When you stop taking the world around you for granted, you start seeing some incredible gifts of nature! Do you take time to appreciate the things your body does everyday? Do you want to live in nature?